Amy Ruiz Fritz July 26, 2009 July 26, 2009 No Comments on >How much will that cost me? 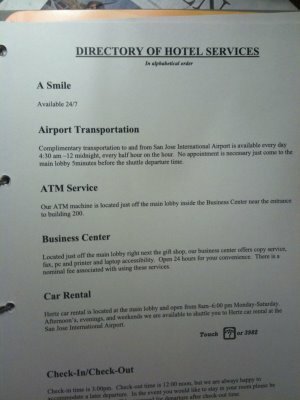 > I was staying at a hotel a while ago and saw this page in the standard book of amenities/room service offered. It doesn’t say that it’s free and to be honest, they were few and far between with regard to the staff.